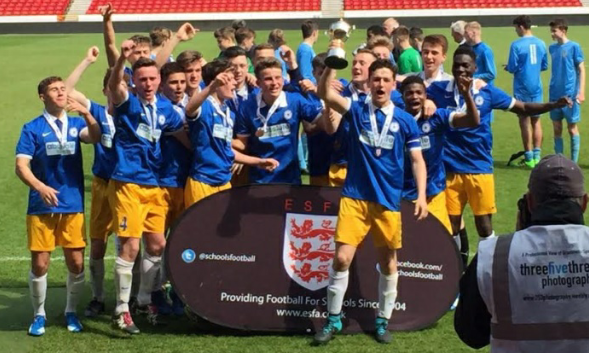 After a fantastic season for rep sides at Sussex Schools FA all eyes turned towards the U16 Boys who were first up to play their final before the U18 Men play on Monday 9th May in Birmingham (National Cup) and the U15 Boys play on Tuesday 17th May in Fulham (South East England League Final). This U16 squad started together at U14 where they reached the National Cup Final in their first year. They followed this up by going on to make the South East England Final the following year at U15. Both times they lost out to Essex. With 8 academy signed players leaving the squad at U16 the squad had to be largely re-built including the whole starting back four and goal keeper. It was clear from the start of the season that despite a lot of change the quality and spirit remained. Indeed the target laid out for them in the first game was to reach the final at the second time of asking (there is no National Cup at U15). This team had to put aside some very strong opponents throughout the knockout stages and after receiving a bye in the first round dispatched Oxfordshire (2-1), Hampshire (4-2), Somerset (2-1) and, after finally getting a home tie, eventually ran out winners against Humberside on penalties to reach the final. In total there were 19 squad players used throughout the competition and it was a shame that 3 had to miss out on a place. Sat in the changing rooms before the game were eight players from the final two years earlier. The experience taken from that loss was to be decisive throughout this final as they helped to instil confidence amongst those that had joined later on. The setting for this game was incredible and you couldn’t help but be in awe of the history that graced the changing rooms and stands at The City Ground. As the game kicked off against North Yorkshire it was clear that it would be tight as both teams tried to shake early nerves. Both sides pressed high into the final thirds maybe wasting too much energy in the wrong areas. The early chances came from Sussex as they looked to take control of the game but no one could finish it off with efforts going narrowly wide or straight at the keeper. North Yorkshire began to claw their way back into the game with number 8 Otis Williams leading the charge. Looking dangerous from set pieces and with more height across the team than Sussex there were some nervous moments after giving away needless free kicks. It was the supporters of Sussex who now had to hold their breath. As the half drew to a close Sussex worked the ball out wide and a clever cross was met by Alfie Rogers who executed a side bicycle kick to perfection only to see the ball rocket towards the top corner and clip the inside of the post. Henri Wilder followed up but couldn’t take the power off the ball to finish and his effort went over the bar. Half time came and the score remained 0-0. The Sussex team were reminded of the game plan which had largely been forgotten in all the excitement and nerves and they returned to the pitch as determined as ever. 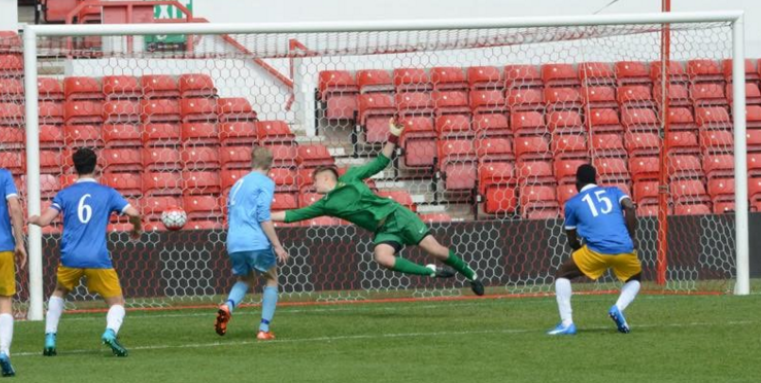 Joel Daly, who had been named man of the match in his schools’ national cup final the day before, was replaced by Luke Brodie up front and soon after the second half began Alfie Rogers was replaced by Anesu Sismayi. The two changes gave fresh legs in key areas and it made the difference that was wanted. Sussex raised the tempo and the nerves seemed to have mostly settled. Sussex were looking the more likely to score as they carved open chances with some clever Football. North Yorkshire were not to be undone so easily. They had been targeting their left channel and Sussex right back Dan Hewett, who had been dealing with everything thrown his way. His intelligent positioning and well timed tackles had broken up many North Yorkshire attacks. This time, however, they made use of the space left open after a Sussex attack broke down and Otis Williams found himself with a yard of space in possession out wide. He took a touch inside and released a screaming shot over the on looking goal keeper, Lorcan Healy, who could only stand and watch as it whistled in over his head. A ‘worldy’ goal from the flank that Alex Plummer and Dan Hewett had protected so well was going to be the only way they would have any joy on that side. 1-0 to North Yorkshire. Sussex captain Tom Climpson called the team into a huddle before the restart and it seemed the words he gave to his team mates were inspiring as it wasn’t long before Sussex were creating chances again. Alex Plummer was replaced by Derrick Kabagozza on the right and Giuseppe Gaute-Lammi, who had given a fantastic performance in the middle of the pitch, was replaced by Sam Hart. The clock was ticking and the time was now on North Yorkshire’s side as Sussex couldn’t convert their chances. Sussex won a free kick out wide and Charlie Williamson stepped up to take it. Charlie had put in a tenacious performance up to this point and had been a key player in attack and defence. Charlie whipped in a clever low cross which was helped across the edge of the six yard box by Fintan Walsh and landed and the feet of substitute Derrick Kabagozza who placed the ball past the keeper to level the score. After picking up a yellow card for a tactical foul, Henri Wilder made way for Alfie Rogers who returned to the pitch, this time in the centre forward role with Luke Brodie moving to his favoured left side. The momentum had swung completely in favour of Sussex and it seemed it was only a matter of time before the next goal came. With nothing converted from the promising attacks it looked like extra time would be needed to settle the game as North Yorkshire hung on and looked to counter attack. A throw on to Sussex deep into opposition territory made its way to Alfie Rogers with his back to goal in the area. With the centre back touch tight Alfie held his ground before turning on his right shoulder quickly. The defender miss-timed his tackle taking Alfie’s legs and not the ball. The penalty was given and Alfie claimed the ball and placed it on the spot. He placed the ball calmly to the keeper’s left sending the keeper the other way. 2-1! With only four minutes remaining Sussex made their last substitute as man of the match Dan Hewett made way to a standing ovation for his role in protecting the flank that North Yorkshire had targeted and Sam Cash took to the field to help see out the game. At the final whistle the celebrations erupted and continued pitch side for a long time afterwards. The parents of all the players have been fantastic in their support of the players this season travelling long distances to help push the team on and it was great to celebrate this success with them. Next up is the U18’s who play Northumberland on Monday and all at Sussex Schools FA will be wishing them well and let’s hope they can bring the trophy back for an incredible Sussex double.